Nurse Practitioners (NPs), also known as Registered Nurses in the extended class, are registered nurses who have met additional education, experience and exam requirements set by the College. They are authorized to diagnose, order and interpret diagnostic tests, and prescribe medication and other treatment. NPs are accountable to the Nurse Practitioner practice standard in addition to the other practice standards and guidelines all nurses must follow. Ontario NPs can now prescribe controlled substances if they have successfully completed approved controlled substances education. On April 19, 2017, the Ontario government approved changes to the regulation under the Nursing Act, 1991, giving NPs this expanded scope of practice. NPs are also authorized to apply ultrasound. Regulations under the Laboratory and Specimen Collection Centre Licensing Act allow NPs to order laboratory tests as appropriate for client care. NPs are expected to apply the practice expectations for public protection set out in the Nurse Practitioner practice standard. The Nursing Act, 1991 allows NPs to prescribe most medication as appropriate for client care. Only NPs who have successfully completed approved education are authorized to prescribe controlled substances. anabolic steroids except testosterone (NPs are authorized to prescribe testosterone). To check whether a medication includes a prohibited controlled substance, search Health Canada’s Drug Product Database. When prescribing medication, NPs are expected to apply the practice expectations for public protection set out in the Nurse Practitioner practice standard. This section provides practice resources for NPs. 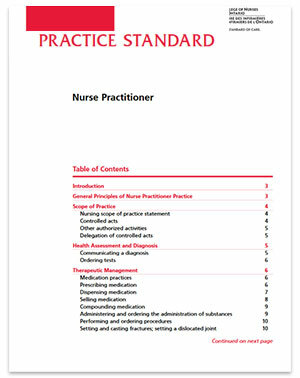 The information is intended to complement the Nurse Practitioner practice standard. The College is not responsible for information provided by external organizations. When ordering tests, NPs must include their OHIP billing number on the requisition. This number authorizes the laboratory or diagnostic facility to bill the Ontario Health Insurance Plan (OHIP) for the tests. For more information on how to obtain an OHIP billing number, contact the Ministry at 1 800 268-1154 (416 314-5518 in Toronto) or visit OHIP’s website to download the Application for OHIP Billing Number for Health Professionals (No. 3384-83). Many quality issues that result in a laboratory's rejection of a specimen can be resolved through upfront communication between the provider ordering the test and the local laboratory. NPs who have questions about laboratory policies and procedures for ordering tests and collecting, labeling, storing and transporting samples are encouraged to consult the laboratory prior to ordering the test to mitigate the risk of specimen rejection. For further information, refer to the Ontario Association of Medical Laboratories' Guidelines. NPs are authorized to apply ultrasound. Ultrasound means any ultrasound that uses soundwaves to produce an image or other data. When applying ultrasound, NPs are accountable to the expectations set out in the College’s practice standards including Nurse Practitioner and Decisions About Procedures and Authority. On February 9, 2018, the Palliative Care Facilitated Access (PCFA) Drug Products mechanism was expanded to include certain NPs. The Ministry of Health and Long Term Care identified both the Nurse Practitioners’ Association of Ontario (NPAO) and the Registered Nurses’ Association of Ontario (RNAO) as organizations that can determine if an NP meets the eligibility criteria to be registered as a PCFA NP Prescriber. The PCFA registration will enable NPs who are authorized to prescribe controlled substances and have demonstrated expertise in palliative care to prescribe high-strength opioids for palliative purposes. provide evidence of continuing education in palliative and end-of-life care. All NPs in Ontario are able to register as PCFA prescribers if they meet the eligibility requirements. To remain on the prescriber list, NPs are required to reapply annually to ensure they continually meet eligibility criteria. The Ontario Drug Benefit Program (ODB) provides drug benefits for eligible Ontarians. Starting on Monday, January 1, 2018, the ODB eligibility will be expanded to include all OHIP-insured children and youth aged 24 and under. Prescriptions written by NPs and dispensed in Ontario are ODB-eligible. NPs must include their College registration number on prescriptions. NPs who prescribe medications to ODB-eligible clients must have an OHIP billing number. This number is not required on the prescription unless you are prescribing a monitored drug. This number is used by the Ministry when adjudicating claims. For more information, or to obtain a billing number, contact the Ministry at 1 800 268-1154 (416 314-5518 in Toronto) or visit OHIP's website to download the Application for OHIP Billing Number for Health Professionals. The ODB formulary is regularly updated and published. Information about ODB and other Ontario public drug programs is available from the Ministry of Health and Long-Term Care. Therapeutic products listed on the Formulary, such as diabetes testing strips and nutritional products prescribed by NPs, are ODB-eligible. The criteria for limited use drugs may or may not identify specific prescribers. For example, some limited use drug criteria specify that only physicians can prescribe them. NPs may also be specified in the criteria. Where the criteria includes NPs or does not identify specific prescribers, NPs are able to prescribe a limited use drug and the drug would be eligible for coverage under the ODB Program. In this case, NPs may prescribe a limited use drug if the client satisfies ODB-listed limited use criteria. NPs need to write the limited use code on the prescription, and limited use prescriptions must include a limited use or nutrition product form that indicates the reason for use. More information about limited use drugs is available on the Ministry’s website. ODB can accept an NP prescription under the EAP. More information about the EAP is available on the Ministry's website. For more information about the Ontario Drug Benefit Act as it relates to NP practice, please read the questions and answers issued by the Ontario government. To prevent prescription fraud, NPs are expected to adopt strategies such as reducing the risk of lost or stolen blank prescriptions. In the event of lost or stolen prescriptions, work with the employer to manage risk and determine whether a report to police is appropriate and in keeping with Ontario’s health privacy law. Inform Ontario Public Drug Programs of lost or stolen prescriptions by sending an email to publicdrugprgrms.moh@ontario.ca or calling 1-866-811-9893 – they will notify pharmacies about missing prescriptions to reduce the potential for fraud. Health Canada’s Special Access Program (SAP) allows practitioners to request access to drugs that are unavailable for sale in Canada. This access is limited to clients with serious or life-threatening conditions on an emergency basis when conventional therapies have failed, are unsuitable, or are unavailable. NPs may request special access to medications that they are legally authorized to prescribe. NPs should consider the additional risks associated with prescribing SAP medications, and discuss these risks with the client. NPs may also wish to consult their professional liability protection provider to address any liability concerns. More information about the SAP, and requirements that practitioners must meet, is available on Health Canada’s website. For information about NPs’ professional accountabilities related to therapeutic management, see the Nurse Practitioner practice standard. The ADP helps eligible Ontarians with long-term physical disabilities access and pay for personalized assistive devices. The Ministry accepts NP authorization forms for several devices and supplies. For more information on the type of devices and the circumstances in which NPs can complete authorization forms, call the Ministry at 1 800 268-6021 (416-327-8804 in Toronto) or visit the Ministry website. ODSP provides income and employment support to eligible Ontarians. When assessing an individual’s eligibility for income support, ODSP accepts an NP’s assessment of a client’s physical or mental impairment and the expected duration of that impairment. As well, NPs can complete an application for a special diet allowance for eligible recipients. For more information about ODSP, visit the Ministry's website. The Workplace Safety and Insurance Board (WSIB) recognizes NPs as service providers. To bill WSIB, NPs must obtain a WSIB provider identification number. To register for electronic billing please complete the Provider Registration online form. For more information, call 416 344-4526 or 1 800 569-7919. Federal legislation authorizes NPs in Canada to sign Form T2201, the Disability Tax Credit Certificate. Please see the Government of Canada's notice. NPs completing this form are accountable to the standards including the Documentation and Nurse Practitioner practice standards. NPs who are employees of a hospital are authorized to order diagnostics and treatments for hospital patients (in-patients and out-patients). NPs who are not hospital employees may apply to the hospital for these privileges; however it is up to the discretion of the hospital whether they will grant privileges. Regulation 965 under the Public Hospitals Act specifies that the hospital’s Medical Advisory Committee (MAC) can make recommendations to the hospital board about granting privileges to NPs who are not hospital employees. The hospital’s MAC is also responsible for the overall supervision and quality of the practice of NPs who have been granted hospital privileges. To apply for hospital privileges, contact the individual hospital. NPs are authorized to admit and discharge hospital patients. The process for an NP to admit and discharge clients is up to the discretion of the hospital. An NP should always consult with the facility for further information on its policies. Under the Health Protection and Promotion Act, NPs have a duty to report certain diseases to the medical officer of health in their local public health unit, if they suspect or know that a person has or may be infected with a communicable disease. The Ministry of Health has a list of the local public health units in Ontario and their locations. For a list of reportable diseases and infectious agents, as well as instructions on reporting, contact your local public health unit. In facilities (such as, hospitals and long-term-care homes), it is the employer's responsibility to report diseases or infectious agents. If you work in a facility, consult the applicable facility policies and procedures on how reporting will take place. In addition, NPs have a duty to report when a client refuses or neglects treatment for a communicable disease. A report containing the client’s name and address should be made to the medical officer of health in their local public health units. If an NP certifies death where a communicable disease was a cause or contributing factor of the client’s death, this information must be reported to the local public health unit. For information about the circumstances in which NPs are authorized to certify death, see Issuing Medical Certificates of Death (below). An NP who has information about any animal bite or other animal to human contact that may result in rabies must report the information to the local medical officer of health as soon as possible. no unexpected events or complications arose. An NP had primary responsibility for the deceased’s care when she or he had an established therapeutic nurse-client relationship with the client and provided care to the client either independently or as a member of a team of health care providers. NPs should not sign the Medical Certificate of Death for clients they did not care for, did not have contact with or did not know. When NPs are unsure if the circumstances surrounding the death of the client were unexpected, they must consult with a physician. Before signing a Medical Certificate of Death, NPs must read and follow the instructions in the Handbook on Medical Certification of Death. The expectations outlined in the handbook apply in all circumstances, including deaths that have occurred in hospital. the immunization is unnecessary because the client is already immune (i.e., there is laboratory evidence of immunity). e) Death occurring at any time or death following any of the above. NPs must make the report within 7 days of determining that a client has, or may have, experienced any of the above reactions. In addition, when health care workers are obtaining consent for immunizations, they must provide education to clients about the importance of immediately reporting to a physician or NP, any reaction that might be a reportable event. NPs can complete the Application for Accessible Parking Permit form (SRLV-129 07-08) for clients. The form is available on the Ministry of Transportation website and at any ServiceOntario driver and vehicle licence issuing office. NPs can complete the Commercial Licence Medical Report form (i.e., drivers’ physical). For further information, visit the Medical Review Section (Commercial Drivers) of the Ministry of Transportation website. It is mandatory for NPs to report certain high risk medical conditions, functional impairments and visual impairments in clients 16 years of age or older. Details of the prescribed conditions NPs must report can be found in Ontario Regulation 340/94, s. 14.1 (3). Also included is discretionary reporting of any person who, in the opinion of the NP, has or appears to have any medical condition that may impair safe driving. A medical reporting form for both mandatory and discretionary reports is available through the Ontario Ministry of Transportation. NPs are not required to report an individual if no nurse-client relationship exists. 1. Is there a requirement for me to practise as an NP in a clinical role to maintain my Certificate of Registration as an NP? the use of advanced nursing knowledge and decision-making skill in health assessment, diagnosis and therapeutics in the treatment of those clients. Each year, NPs will be asked to declare if they have practised as described above within the previous three years. NPs who do not meet this requirement will not be eligible to remain registered in the Extended Class. 2. What is the declaration of practice? When do I make this declaration? While completing the Annual Membership Renewal form each year, and at any other time upon request by the College, NPs will be required to declare whether they practised as NPs, as described in the first question above, within the previous three years. NPs who hold multiple specialty certificates in the Extended Class will be required to make this declaration for each specialty certificate they hold. Upon request by the College, members must provide evidence to support their declaration. 3. a) I am an NP-Primary Health Care (PHC) working in a Long-Term Care home. Am I required to practice with clients in all age groups to maintain my current certificate of registration? No. Each NP specialty certificate represents a broad client population and a wide age range. The client population for the PHC specialty is “family all ages.” Therefore, you can meet the NP declaration of practice requirement by practising, as described in the first question above, with clients in any or all age groups within your specialty. As always, you are expected to meet the practice expectations for public protection described in the Nurse Practitioner practice standard. b) I know I must fulfil the College's QA (Quality Assurance) obligations to maintain my certificate of registration. How will my practice within the NP-PHC specialty be assessed when I'm selected for practice assessment in the QA program? To protect the public, the QA program requires each NP to demonstrate competence for the specialty certificate in which she or he is registered. This is because NPs may work in a wide variety of practice settings and a wide range of clients are covered by each specialty certificate. In addition, Ontario law requires Colleges to assess entry-to-practice competencies through their quality assurance processes. When you are selected to participate in the College’s QA practice assessment, you will be required to demonstrate the core competencies and the use of advanced knowledge and decision-making skill in health assessment, diagnosis and therapeutics with a primary health care "family all ages" population. 4. The clinical practice requirement doesn’t recognize that NPs contribute to the health system in many ways beyond the provision of direct client care. Why is the College requiring NPs to engage in direct clinical practice with clients? The College recognizes there are numerous ways in which nurses provide positive contributions to client care and the health system, and that nursing practice does not always involve direct interaction with clients. Examples include policy development, administration, research and education. The College appropriately and safely regulates these aspects of nursing practice through the General Class. The Extended Class exists to authorize RNs who have met specific requirements to perform certain controlled acts (e.g., communicating diagnoses, prescribing medication) that are directly linked to clinical practice. To protect the public, NPs are expected to demonstrate and maintain competence to practise in a clinical NP role. This has been an expectation under the Nurse Practitioner practice standard since October 2011. Adding this requirement to the Registration Regulation reinforces the expectations and standards, and is consistent with those of other nursing jurisdictions across Canada. 5. What happens if I have not practised in a clinical NP role in the previous three years? If you have not practised as an NP as described in the first question in the previous three years, but have practised nursing during that time, then your Extended Class certificate will be revoked and replaced with a General Class certificate. If you have not practised nursing at all in the previous three years, then you must either register in the Non-Practising Class or resign from the College. 6. Do NPs have to practise for a minimum number of hours to meet the NP practice requirement? The College does not specify the number of hours that NPs must practise within the three-year timeframe. The amount of practice needed to maintain NP competence in the areas of health assessment, diagnosis and therapeutics in the treatment of clients will vary for individual NPs based on their experience, knowledge and skill level. It is up to each NP to determine how much practice is required to maintain that level of competence. NPs are also required to meet continuing competence requirements related to application of practice standards and related NP competencies. 7. Does the College provide a list of nursing positions that satisfy the NP practice requirement? No. Nurse Practitioners work in roles that involve various dimensions of nursing practice, including clinical and nonclinical components. Therefore, what must be determined is whether an individual NP meets the requirement as outlined in the first question, irrespective of her or his position. NPs are expected to reflect on their nursing practice and determine whether it satisfies the practice requirement. 8. I am an NP and a faculty member in an approved NP university education program. Does my position meet the evidence of practice requirement? The College does not determine whether a position fits the requirement; it is whether an individual NP meets the requirement. You are expected to reflect on your role as a faculty member and determine whether you satisfy the practice requirement for NPs as described in the first question. 9. Does volunteering in an NP role meet the NP practice requirement? Providing nursing services in a volunteer capacity meets the requirement if it is consistent with the definition of NP practice as described in the first question. Keep in mind that you will have to provide evidence to support your declaration if the College requests it. 10. I am registered as an NP and hold both Adult and Paediatrics specialty certificates. I work in a role that involves providing NP health care services to an adult population. Do I meet the evidence of NP practice requirement? You must demonstrate practice, as described in the first question, with a client population that is relevant to each specialty in which you are registered. In this case, your Paediatrics specialty certificate will be revoked if you do not practise with paediatric clients in accordance with the practice requirement for NPs as described in the first question. Assuming your practice with adult clients is consistent with the NP practice requirement, your NP registration with the Adult specialty certificate will not be affected. If I receive a General Class certificate because I did not meet the practice requirement for NPs, what will I need to do if I want to resume practise as an NP in Ontario? If you have been practising as an NP in another jurisdiction, then your practice there will be assessed to determine whether it meets the above description. You may also be expected to meet other reinstatement requirements, such as successful completion of the jurisprudence exam. Do graduates of approved NP programs have to meet the practice requirements to become registered as NPs? Yes. Evidence of practice in the NP role is a non-exemptible registration requirement. If you completed an approved NP program within the past three years, then you will satisfy the evidence of NP practice requirement. If you have not practised accordingly, then you will be required to undergo an evaluation approved by the College’s Registration Committee to determine whether you meet the practice requirement. The evaluation may conclude that you meet the NP practice requirement for registration, or it may identify the need for you to complete further training, experience, examinations or assessments to meet the requirement. I am an RN who is practising in Ontario and applying to register as an NP. Why do I have to successfully complete the jurisprudence exam if I am already practising nursing in Ontario? The jurisprudence exam is a non-exemptible registration requirement for applicants. The exam assesses an applicant’s awareness and understanding of the legislative and regulatory framework (i.e., laws, regulations, by-laws, practice standards and guidelines) that governs the nursing profession specifically in Ontario. For NP applicants, the jurisprudence exam includes questions applicable to all nurses in Ontario and questions that are unique to NP practice. While many NP applicants are already practising nursing in Ontario as RNs in the General Class and would likely be familiar with the concepts assessed on the jurisprudence exam, they must demonstrate that they have this knowledge by successfully completing the RN(EC) Jurisprudence Examination before they can register in the Extended Class. I just received my NP Certificate of Registration. How do I sign my name? No other variations of the NP title may be used. I work in a clinic where the primary health care providers charge clients fees for services, such as completing forms or providing sick notes. Can I charge clients fees for these types of services? Most NPs are salaried employees. To reduce the risk of conflict of interest, ensure there are clear parameters about whether these services are offered during regular work hours and how the revenue generated from these fees will be managed. You should work with your employer to develop a clear workplace policy about charging clients fees. Policies should be consistent with the standards and regulations governing affected health professionals. Decisions should be made in the best interest of clients and the policy should address ethical considerations, including the process for clients who cannot afford to pay a fee. Refer to the College’s Professional Misconduct document for information about nurses’ professional accountabilities when charging fees. I am an NP employed at a primary health care clinic. I gave my employer notice and they will not recruit a new NP before I leave. What are my professional accountabilities in this situation? After I’ve left, can I follow-up on diagnostic tests that I have ordered? When you are no longer employed at this clinic, you cannot access client health records, including diagnostic test results. You can only remain involved in the care of these clients if your employment is extended, or you are retained by the employer in some other way (e.g., contract), to provide health services to these clients. You are accountable for working with the employer to facilitate continuity and transfer accountability of client care. This may include strategies such as: notifying clients and giving them information about how their health care needs will be met, prioritizing high-risk clients for appointments, and ensuring the employer is aware of pending diagnostic test or lab results. The employer is responsible for ensuring strategies are in place to meet client-care needs while they recruit your replacement. This may include making arrangements with other service providers, or using other strategies that fit the clients’ needs. I am an NP-Pediatrics and I provide care to children with complex health issues. Some of my clients are approaching adulthood and I have not been able to find another health care provider to care for them due to their complexity. Can I continue to provide care to these clients until another health care provider can take over? Yes. In limited circumstances, NPs may provide health care services to clients outside the population group associated with their specialty certificate. This should only happen if they have the knowledge, skill and judgment required, and the decision to provide care is based on a client’s best interest. In your case, continuing to provide care to your clients promotes continuity of care and meets the client’s needs. NPs who may have to provide health care services to clients outside the population group associated with their specialty certificate, should ensure that clients and other members of the health care team are aware of their specialty certificate. I am an NP working in a community health clinic. Can I complete a Form 1 for a client? No. The regulations under the Mental Health Act specify that an Application by Physician for Psychiatric Assessment (Form 1) be completed by a physician. Furthermore, a Certificate of Involuntary Admission (Form 3) also requires a physician’s assessment and the examining physician’s signature. For this reason, an NP would not be able to admit involuntary clients under the Mental Health Act. For more information on NP accountabilities, read the Nurse Practitioner practice standard. Can I perform point of care testing, such as rapid strep tests and urine dipstick analyses? No. Health care professionals who perform laboratory tests for the purpose of diagnosing and treating their clients require an exemption under the Laboratory and Specimen Collection Centre Licensing Act. NPs are not exempt under this legislation. Therefore, you may perform point of care laboratory tests only with proper authorizing mechanisms (for example, a medical directive). The College has recommended to government that this legislation be changed to exempt NPs and enable them to perform point of care laboratory tests, which are an essential part of NP practice. For more information, see Bill 179 FAQ. I write orders such as requisitions for laboratory and diagnostic tests for clients when they are discharged from hospital. What is my accountability in following up with clients in this situation? As the health professional who ordered the test, you are also accountable for following up, or ensuring there is a reliable system in place for appropriate follow-up. This means that you and the hospital should have a process for reviewing the results from the tests you have ordered and following up with clients. You can facilitate the safe transfer of accountability by providing a timely discharge summary, including information about tests ordered. To promote continuity of care, you can make sure laboratory and diagnostic requisitions include a request to have test results sent to both yourself and the Primary Health Care provider. how they will receive the test results. You may also want to give a copy of the discharge summary to clients. The accountabilities when ordering tests are outlined in the Nurse Practitioner practice standard. What is my accountability if a client does not undergo a test that I have ordered? There is a shared accountability; ultimately, clients make their own decision about whether to undergo a test. You are accountable for ensuring clients have the necessary information to make an informed decision about taking the test. In addition, you are expected to ensure systems are in place to track that you have ordered the test. This enables you to follow up with the client if required. If you learn that your client has not taken the test, it provides you with an opportunity to explore the client’s reasons and engage in additional health teaching. You should document your follow up with the client, including any unsuccessful follow-up attempts if the client does not respond. NPs can apply ultrasound, which is a controlled act. The forms of energy that NPs are authorized to apply are specified in law. When applying ultrasound, NPs are accountable to expectations in the practice standards including Nurse Practitioner and Decisions About Procedures and Authority. Why don’t the new expectations talk about ultrasounds or forms of energy? Isn’t that what changed? You may have noticed that we do not have specific practice expectations related to NPs ordering or applying ultrasound. The College’s standards and guidelines are broad and principle-based to apply to a variety of NPs working in different roles and practice settings. The College develops practice standards to outline accountabilities and expectations regardless of the clinical areas or practice settings in which NPs work. You can read more about developing standards here. Aside from the recent changes to the Decisions About Procedures and Authority and the Nurse Practitioner practice standards, what other practice expectations exist related to applying ultrasound? For more information about these accountabilities see the Decisions About Procedures and Authority, Professional Standards and the Nurse Practitioner practice standards. Can I order physical restraints? Whether an NP can order restraints depends on the setting. The Patient Restraints Minimization Act, 2001 specifies that only a physician or a person specified by regulation can order a restraint. Only physicians are authorized to order restraints for patients in hospital as there are no regulations under the Patient Restraints Minimization Act that lists other persons. In long-term care, NPs are authorized to order restraints as they are specifically listed in regulations under the Long-Term Care Homes Act, 2007. I noticed there were changes to the diagnostic tests NPs can order and apply. Do I need to complete education before taking on these new authorities? Some NPs are already performing the new authorities in their practice setting. For others, this is a new activity to integrate into their practice. As part of continuing competence, NPs should reflect on their practice, identify learning needs, and develop and meet learning goals. Before taking on these or any new authorities, you may identify that you need to complete education or training, and/or learn from an expert in your practice setting. Why must I include my registration number on prescriptions? The College requires that your registration number be included on prescriptions for authenticity. An NP’s registration number is a unique identifier and the most direct way for a pharmacist to verify that the prescription was authorized by a legitimate prescriber and to make direct contact with the NP to validate the prescription. The registration number is also used by insurers, such as the Ontario Drug Benefit program and others, to verify prescriptions when reimbursing clients or pharmacists directly. What are the requirements when prescribing Tramadol? Tramadol is a monitored drug under the Ontario government’s Narcotics Safety and Awareness Act, 2010. NPs and other health professionals who prescribe or dispense monitored drugs must know and comply with specific legal requirements. For example, NPs must include a client identification number from a government-approved form of identification (e.g., Ontario Health Card) on the prescription for Tramadol. For more information about the legislative requirements, including a list of the acceptable forms of identification, visit the Ministry of Health and Long-Term Care’s website. Like other opiates, Tramadol is subject to potential misuse, abuse, addiction or diversion. NPs are expected to consider this in their clinical decision-making to ensure safe prescribing. For example, NPs should assess clients for potential drug abuse behaviour and document their findings. The Canadian Guideline for Safe and Effective Use of Opioids for Chronic Non-Cancer Pain provides useful guidance. As always, NPs must apply the practice expectations for public protection described in the Nurse Practitioner practice standard. Can I co-sign a prescription written by a physician in the U.S. so a U.S. citizen can fill the prescription in Ontario? No. NPs should not co-sign prescriptions written by any other health professional, regardless of where they are located. A prescription is a communication between the prescriber and dispenser (pharmacist). It includes details such as the prescriber’s contact information, protected title, registration number and signature. This makes it clear where the accountability lies. Co-signing a prescription blurs the lines of accountability. NPs prescribe medication in the best interest of a client only when there is a therapeutic professional relationship with the client and only for therapeutic purposes. Before prescribing medication, NPs must have enough information about a client to assess the clinical rationale for the medication. If you determine that a medication should be prescribed after assessing a client, then you may write your own prescription. You are responsible for meeting the expectations in the Nurse Practitioner standard. I am an NP working in independent practice, can I order and administer Botox via injection for cosmetic purposes? Yes, NPs have the legal authority to prescribe botulinum toxin (Botox) and administer this medication via injection for cosmetic purposes. When performing these activities, NPs are expected to apply the requirements outlined in the Nurse Practitioner practice standard. have the resources available to perform the procedure safely. NPs in independent practice must ensure that they are practising according to all the College standards and applicable laws. For example, the Nurse Practitioner practice standard outlines the only circumstances where NPs can sell medications to clients as well as expectations for preventing conflict of interest. The Independent Practice guideline and the Professional Misconduct document highlight other considerations for independent practice. Can an NP prescribe Mifegymiso? Yes, NPs are legally authorized to prescribe and dispense Mifegymiso. It is a combination of medications that is indicated for the medical termination of early pregnancy. Before prescribing Mifegymiso, NPs must ensure they have the knowledge, skill and judgment to do so and can manage all possible outcomes of prescribing this medication. Health Canada has set requirements for the pharmaceutical company that provides Mifegymiso to mitigate the risks associated with this medication. These include providing prescribers with a medication guide as well as a 24-hour support line for clients. For more information, visit the Health Canada website. Also read the Mifegymiso product monograph. Although not a requirement, NPs who will be prescribing Mifegymiso should consider completing the Accredited Medical Abortion Training program developed for health professionals who are involved in prescribing and dispensing this medication. Mifegymiso can now be dispensed directly to clients. When prescribing or dispensing medication, NPs are expected to apply the requirements outlined in the Nurse Practitionerand Medication standards. NPs who do not prescribe Mifegymiso are expected to refer clients who may require this medication to another NP or physician who is able to prescribe the medication. Since Mifegymiso can only be provided in early pregnancy, this referral should be timely. You can find the expectations for consultation and referral in the Nurse Practitioner practice standard. The Ethics standard outlines the expectations for when a nurses’ personal values conflict with a client’s wishes. Can NPs in Ontario prescribe medical cannabis? Yes. NPs in Ontario are authorized to write an order for, or sign a medical document authorizing the use of cannabis for medical purposes. You are accountable for ensuring that medical cannabis is an appropriate evidence-based treatment for your patient. You are also accountable for meeting the accountabilities around therapeutic management outlined in the Nurse Practitioner practice standard. NPs completing a medical document authorizing the use of cannabis for medical purposes should counsel the patient about risks, side effects, safe storage and the importance of obtaining the marijuana from a legal source. NPs must comply with requirements under the Cannabis Regulations. As outlined in the regulations, NPs may only provide medical documents for patients under their professional treatment and if cannabis is required for the condition for which the individual is receiving treatment. the period of use (maximum 1 year), specified as a number of days, weeks or months. The NP must sign and date the medical document. The medical document is only valid for the period of use specified within it. What are controlled substances and why are they restricted? A controlled substance is one that is included in Schedule I, II, III, IV or V of the federal Controlled Drugs and Substances Act. Controlled substances are used in healthcare to treat a wide variety of conditions including, but not limited to, pain, anxiety, epilepsy and sleep disorders. They include opioids, benzodiazepines, amphetamines, sedatives, anti-emetics and hormonal therapies, among others. Controlled substances are restricted because they present a high risk for potential misuse, addiction and diversion. Can NPs prescribe controlled substances? Only NPs who have successfully completed College approved controlled substances education are authorized to prescribe controlled substances in Ontario. For more information about the education, read Q&As: Controlled Substances Education Requirement. Is controlled substances content part of NP program curriculum? Yes. Controlled substances content is integrated into curriculum for all Ontario NP programs starting September 2017. That means that students starting Ontario NP programs from September 2017 onwards will meet the required controlled substances content and will not have to complete a standalone course. Members and applicants who don’t have this content in their NP program can take Council-approved controlled substances courses to gain the foundational competencies that are unique to controlled substances, and meet their education requirement set out in regulation. Are there any controlled substances that NPs can’t prescribe? How can I tell if an NP is authorized to prescribe controlled substances? Can NPs prescribe methadone and diacetylmorphine? Under the Controlled Drug and Substances Act (CDSA) NPs have the authority to prescribe and administer methadone without an exemption. NPs also have the authority to prescribe diacetylmorphine. Only NPs who have successfully completed College approved controlled substances education are authorized to prescribe controlled substances in Ontario, this includes methadone, buprenorphine and diacetylmorphine. Additional resources are also available to support NPs continuing competence and clinical decision making. Activities associated with controlled substances are high risk. As with any other activity or procedure NPs engage in, they are expected to have the knowledge, skill and judgment to prescribe methadone and diacetylmorphine in a safe, competent and ethical manner. NPs are expected to understand the unique risks associated with prescribing any controlled substance and incorporate relevant evidence-informed strategies to mitigate these risks. NPs are also expected to meet the accountabilities outlined in the Nurse Practitioner practice standard and ensure they have the competence to prescribe methadone, buprenorphine and diacetylmorphine. Can I phone in a prescription for a controlled substances to a pharmacy? Telephone orders and other verbal orders should only be used in limited circumstances as there are inherent risks with using verbal orders. Under federal law, certain controlled substances (most narcotic medications) cannot be ordered without a written prescription. If phoning prescriptions to a pharmacy, NPs should ensure that the medication can be prescribed by phone and should document the rationale for why they needed to do so by telephone. The Ontario College of Pharmacists provides a resource that may be helpful: Prescription Regulation Summary Chart (Summary of Laws) or visit their website – www.ocpinfo.com. Am I allowed to order controlled substances with refills? Under federal law, there are specific requirements about refills for controlled substances. The Ontario College of Pharmacists provides a resource that may be helpful: Prescription Regulation Summary Chart (Summary of Laws). You must meet the expectations for prescribing controlled substances outlined in the Nurse Practitioner practice standard. These include prescribing a quantity of controlled substances to be dispensed that balances the need to reassess and monitor the client with the risk of harm that may result if the client runs out of medication. NPs providing episodic care should prescribe the minimum amount necessary until the client can be assessed by their regular care provider. I’m involved in procuring medications for my practice setting. Are there any legal requirements around reporting theft of controlled substances? There are legal requirements under the Controlled Drugs and Substances Act related to record-keeping and reporting theft of these medications. You must report the loss or theft of controlled substances to Health Canada’s Office of Controlled Substances within 10 days. I’m an NP that is not authorized to prescribe controlled substances. What do I do if I determine a client requires a prescription for a controlled substance? NPs can expect to encounter clients requiring prescriptions for controlled substances, since many medications are controlled substances. You should plan for this anticipated client care need by establishing strategies consistent with College standards and guidelines. You should also work with your employer to ensure you have access to resources for meeting client needs. In this case, the resource you need is the ability to refer to a health professional such as an NP or physician authorized to prescribe controlled substances. The client’s prescription must be filled out by the authorized prescriber in a manner that is consistent with their regulatory obligations. NPs who are not authorized to prescribe controlled substances must not taper a controlled substance or renew a prescription for a controlled substance as these are considered prescribing. If you commonly encounter clients in your practice that require controlled substances you should consider completing the education requirement that would authorize you to prescribe controlled substances. As expected for any activity, you may have additional learning needs you have to meet, relevant to your setting and client population. I’m an NP who is not authorized to prescribe controlled substances. I assessed a client and determined that she needs treatment with a controlled substance. The physician I work with agreed with my findings and proposed a treatment plan. Can I complete this prescription based on the outcome of my consultation with the physician? No. Consulting with a physician does not give you the legal authority to prescribe any medication. The authority to prescribe medication comes from the legislation. Therefore, in this case the physician should be asked to prescribe the controlled substance. Physicians have their own professional accountabilities, which may also require them to personally assess the client. I’m an NP interested in developing a policy related to weaning clients off high doses of narcotics. Does the College have guidelines to support this? The College does not have guidelines related to weaning clients off high doses of narcotics. Our role and expertise is to provide standards and resources that are applicable to nurses who work in a broad range of roles, across various settings. That being said, the College recognizes the need for NPs to have resources about this area of NP practice. We have developed a page that points NPs to a variety of resources related to controlled substances, including content about weaning (tapering) controlled substances. The controlled substances resource page is one source of information. You may need to seek out other sources of information, including information that is specific to your setting and/or client population. You are accountable for using the best evidence to inform your clinical decisions. NPs are accountable for taking appropriate action to resolve or minimize the risk of harm to a client from a medication adverse reaction (from the Medication practice standard). Implementing a policy that supports weaning clients of high doses of narcotics is one example of meeting this expectation. With client interest and safety in mind, you are expected to work with your interdisciplinary colleagues to identify gaps in available policies, procedures and processes, and if needed, develop them. I’m an NP and I work in a walk-in clinic. I’m concerned that clients are drug-shopping to divert controlled substances. How do I spot this behaviour and manage any increased client pressure? First, you should read the Nurse Practitioner practice standard to know your accountabilities when faced with this types of situation. For example, the practice standard says NPs are accountable for incorporating evidence-informed strategies for assessing, managing and monitoring the risks of misuse, addiction and diversion. A very helpful source of evidence-informed strategies is the College of Physicians and Surgeons of Ontario’s policy document entitled Prescribing Drugs. It contains practical steps to help prevent diversion, misuse and abuse, as well as identifying common aberrant drug-related behaviours. You should also consider if you are the most appropriate care provider for that client and/or whether you need to refer or consult an expert. For example, consider if you have the knowledge, skill and judgment to manage the situation. The Nurse Practitioner practice standard says NPs need to identify when collaboration, consultation and referral are necessary for safe, competent and comprehensive client care. So, you may want to consult another healthcare professional to benefit from their expertise. I’m an NP and I have clients who are addicted to controlled substances. I want to help. Does CNO have guidelines to support my practice? The Nurse Practitioner practice standard states that NPs are accountable for using strategies to reduce risk of harm involving controlled substances, including medication misuse, addiction and diversion. The College does not have guidelines specific to treating clients who are addicted to controlled substances. Our role and expertise is to provide standards and resources that are applicable to nurses who work in a broad range of roles, across various settings. However, we recognize the need for NPs to have informed resources in this area of NP practice. We have developed a page that points NPs to a variety of resources related to controlled substances, including some resources related to treating opioid dependence. The controlled substances resource page is one source of information. You may need to seek out other sources of information, including information that is specific to your setting and/or client population. You are accountable for using the best evidence to inform your clinical decisions. With client interest and safety in mind, you are expected to work with your interdisciplinary colleagues to identify gaps in available policies, procedures and processes, and if needed, develop them. I’m a new NP working in an emergency department and I treat a variety of clients. I would like information for my prescribing practice (e.g., information related to cancer pain, chronic pain, managing withdrawal symptoms, dealing with opioid tolerant clients). Does the College have guidelines to support this? NPs are accountable for implementing evidence-informed therapeutic interventions (from the NP practice standard). The College does not have guidelines related to the clinical areas you are inquiring about. Our role and expertise is to provide standards and resources that are applicable to nurses who work in a broad range of roles, across various settings. However, we recognize that to meet the expectation in the Nurse Practitioner practice standard that says NPs are accountable for implementing evidence-informed therapeutic intervention, NPs need resources to inform this area of their practice. We have developed a page that points NPs to a variety of resources related to controlled substances, including content that will support the areas you mentioned in your question. The controlled substances resource page is one source of information. You may need to seek out other sources of information, including information that is specific to your setting and/or client population. My client is not compliant with the plan of care and is refusing urine screening to monitor medication compliance. I am concerned about prescribing controlled substances in light of this. What should I do? As an NP, you are responsible for monitoring the client’s response to the prescribed substance and for assessing, managing and monitoring the risks of misuse, addiction and diversion. You are also responsible for implementing strategies to mitigate these risks, and should only perform procedures or activities when you have access to the appropriate client information. Several factors can contribute to conflict between an NP and a client. For example, this can occur if an NP judges or misunderstands a client (e.g., the client may feel the NP is not listening to, or respecting, their values, opinions or beliefs). NPs may need to reflect on and modify their communication style to meet the needs of the client and find the best possible solution in any complex nurse-client situation. Ultimately, if the challenges with your client continue and place the client at risk, then you are accountable for acknowledging when there is a diminished therapeutic relationship and for requesting a transfer of care. For more information on the accountabilities mentioned above, read the Therapeutic Nurse Client Relationship practice standard, Nurse Practitioner practice standard and Conflict Prevention and Management practice guideline. I have been managing a client with complex addiction issues. My client is pushing for prescriptions that are not in their best interest and I’ve grown increasingly concerned about my personal safety. How do I manage this? The College does not expect nurses to put their lives or personal safety at risk when caring for clients. As the primary NP, consider if you are the most appropriate care provider for that client and/or whether you need to refer to, or consult, an expert such as an addictions specialist or psychiatrist. For example, consider if you have the knowledge, skill and judgment to continue treating this client. Also, NPs are accountable for identifying when collaboration, consultation and referral are necessary for safe, competent and comprehensive client care. Employers also have accountabilities under the Occupational Health and Safety Act – they are accountable for establishing a safe work environment and minimizing real or potential risk to employees and clients alike. The College encourages nurses to work collaboratively with their employers, as well as colleagues, to mitigate real or potential threats. If needed, they should develop policies, procedures and processes that are specific to the practice setting and driven by client interests and safety. For more information on maintaining a quality practice setting and guidelines for decision-making, read Refusing Assignments and Discontinuing Nursing Services and Ethics. Where can I find information about Ontario’s Narcotics Strategy, and the Narcotics Monitoring System? Information about Ontario's Narcotics Strategy and the Narcotics Safety and Awareness Act, 2010 can be found on the Ministry of Health's website. As part of the Narcotics Strategy, the province has established the Narcotics Monitoring System (NMS) to monitor the prescribing and dispensing of controlled substances. Although its name implies the monitoring of narcotics, the NMS monitors all controlled substances as well as opioids that are not controlled substances (such as medications containing Tramadol). The main purpose of the NMS is to examine drug-use patterns to inform harm reduction strategies and education initiatives, and improve prescribing and dispensing practices related to monitored drugs. If illegal activity or professional misconduct is suspected, the Ministry may report information from the NMS to law enforcement bodies and regulatory colleges. Can I dispense medications that are controlled drugs and substances? Yes, you can dispense a controlled substance that you prescribed or that was ordered by a physician or dentist with whom you work. The Nurse Practitioner and the Medication practice standards describe the practice expectations for public protection when dispensing medication. How will this authority affect medical assistance in dying? Medical assistance in dying protocols may require controlled substances. This regulation change may enable NPs to provide medical assistance in dying protocols (in accordance with legal requirements). See Guidance on Nurses’ Role in Medical Assistance in Dying for a description of legal and professional requirements. How often am I required to complete approved controlled substances education? This is a one-time requirement to gain foundational competencies that are unique to controlled substances. You may have other learning needs related to controlled substances. As part of commitment to continuing competence and quality improvement, you are expected to engage in practice reflection to identify learning needs, and set and achieve learning goals. I notice that I may be required to put an “identification number” on a medication that I dispense. What is the identification number? The identification number is assigned to track medications from the point of procurement to the point they are provided to a client. The purpose of an identification number is to trace a medication back to the manufacturer. In the event of safety concerns (e.g., a medication recall), the identification number enables health professionals to follow up with clients appropriately. You should consult your employer about whether this tracking system exists in your practice setting and how to obtain the identification number. If such a system does not exist, you should advocate for measures to ensure safe medication practices. If you are self-employed, you are expected to establish your own tracking system. The practice expectations for public protection when dispensing medication are described in the Nurse Practitioner practice standard. Why is the drug manufacturer’s name required on the label of a medication I dispense? What if this information is not available to me? Including the manufacturer’s name is another mechanism used for tracking medication. Depending on your practice setting, this information may not be readily available to you. For example, if you are dispensing medication from a supply that is stocked by a pharmacist, the medication may have been re-packaged, and therefore, while this information is available to the pharmacist, it is not available to you. If you do not have access to this information, then you are not required to include it. When an NP is compounding a cream for topical application, the NP is expected to have the manufacturer’s original packaging for the various substances used in the compound. Therefore, when compounding, you must include the manufacturer’s name on the label if the compound is being dispensed to a client. Is it a conflict of interest for NPs who prescribe a medication to also dispense or sell that medication? No. The College has developed specific conflict-of-interest provisions to reduce the risk of NPs finding themselves in a position of conflict. For example, NPs cannot charge “dispensing fees” or obtain a profit from the sale of a medication. NPs cannot obtain any benefit as a result of prescribing, dispensing or selling medication. A “benefit” is defined as any financial or non-financial incentive, whether direct or indirect, that conflicts with an NP’s professional or ethical duty to a client. NPs are expected to base treatment decisions on best available evidence, clinical judgment and client needs. NPs do not prescribe a particular medication because it is available for sale in the practice setting. The practice expectations for public protection are described in the Nurse Practitioner practice standard. Can NPs sell medication? Can I ask an administrative assistant to conduct the financial transaction associated with selling medication? the medication is sold as part of a health promotion initiative. NPs cannot charge more than the actual cost of the medication, neither for personal financial gain nor to account for overhead or any other expense incurred. Although NPs cannot delegate the sale of medication, if the above circumstances are met, an administrative assistant may conduct the financial transaction, which is the only one aspect involved in a sale. For further information about the practice expectations for public protection when selling medication, see the Nurse Practitioner practice standard. Can I apply defibrillation or electrocoagulation? No. Until the necessary regulations under the Regulated Health Professions Act, 1991 are put in place by government, you must continue to use delegation for applying forms of energy, such as defibrillation or electrocoagulation. For further information about forms of energy, click on the Practice Resources tab. The College will advise members through its website, its Quality Practice newsletter and The Standard when the regulatory amendments are approved and take effect. Can I perform transvenous cardiac pacing? No. Although transvenous cardiac pacing is not explicitly listed as a form of energy under the Regulated Health Professions Act, 1991 (RHPA), the College’s interpretation is that this procedure falls under “cardiac pacemaker therapy,” which is listed. Until the necessary regulations under the RHPA are put in place by government, you must continue to use delegation for applying forms of energy. For further information about forms of energy, click on the Practice Resources tab. Do I require a ‘consulting’ physician? There is no longer a legal requirement for NPs to establish and maintain a consultative relationship with a physician; therefore, you do not require a ‘consulting’ physician. However, the consultation standards have not changed, in that you are expected to consult physicians and other health professionals when you encounter client care needs beyond the legal scope of NP practice or your individual competencies. Furthermore, some employers require NPs to have a consulting physician (see question below). To make consulting possible, you would establish a network of other health professionals, as appropriate, to meet client care needs. If your current consulting arrangements with physicians meet this objective, then you should continue with those arrangements. The practice expectations for public protection when providing interprofessional care and consultation are described in the Nurse Practitioner practice standard. I work in a long-term care home. Why is my employer asking for the name of a ‘consulting’ physician with whom I work? Notwithstanding the information provided in the question above, certain employers may have specific requirements related to NP consultation. For example, regulations of the Long-Term Care Homes Act, 2007 may require an NP to tell the long-term care home the name of the physician with whom the NP has a consultative relationship. NPs should consult their employers to determine whether specific requirements exist.